In today’s Union Update, we reflect on the Closed Beta. Plus, make sure to read all the way to the end for a special announcement! Wow, what a week it has been for all of us on the Anno Dev Team! So, where to start? First by saying “Thank you” to every single one of you who has participated in our Closed Beta- you managed to not only help us reach, but actually crush our expectations for this test. From the number of players, to how often you came back and how long you played during these few days, we were truly humbled by your dedication to helping us test Anno 1800. We also want to thank everyone who created content for the game, be it live streaming, videos, screenshots or even creating the first cheat sheets and tools to calculate the most efficient production chains. Many of us on the team were glued to our various screens to watch streams and videos throughout the test, and we have to be honest with you: seeing “our baby” reach the #5 spot for most viewed games on Twitch on Friday night was more than just a little bit surreal. Fair to say that you all made our day(s), and that seeing all this excitement will be a great morale boost for the team as we tackle the feedback reports in the weeks to come. But of course, it is not just about making us feel all warm and fuzzy inside. Watching so many different players of all experience and skill levels was also very helpful for our game and UX designers as they were able to check many of our assumptions and guesses how players would behave as they get familiar with Anno 1800 against real player behavior. Which brings us to your feedback. Not surprisingly, we have received plenty of feedback from you, ranging from crash reports to bugs, wishes for improvements and praise for new gameplay elements you love (like the blueprint mode). Game Balance: As you know, we recently made the difficult decision to delay Anno 1800 to April 16. Between these additional weeks of development and all the feedback from our testers, you can safely assume that nothing you have seen balance-wise should be considered final. This is also true for the influence system (more on that in a second). Desyncs: First, a big thank you to everyone who helped test the multiplayer mode. A test at the scale of this Closed Beta is immensely helpful for us when it comes to testing multiplayer functionality, as having so many players (on many different ISPs, routers etc.) out in the wild helps to find lots of issues we would never come across in our internal testing. Thanks to your help, we have received a lot of valuable data to improve the multiplayer experience at launch. One thing to keep in mind here is that a lot of different behind the scenes issues can result in a desync error for the player (for example, you could still experience desyncs after our Closed Beta Update 1 fixed several different issues causing them, though we managed to dramatically decrease their frequency). Performance: Another topic that we saw many questions around was in-game performance. This is another aspect of the game where we are hard at work optimizing and improving to ensure that as many people as possible can enjoy playing Anno 1800. This large-scale test helped us to get much more insight into the plethora of system configurations in our community. Influence: We addressed this topic in our notes for the Update from Friday, but want to reiterate our points here. We know that your experience with the influence system during the Closed Beta was not optimal, for a variety of reasons. Three of them are especially noteworthy. As you know, the game is still in development, and this is especially true of the influence system. The current balance you have seen in the Closed Beta is not final, and we will keep iterating on it, as we get closer to launch. You have already seen some live changes to that during the test. One important aspect to keep in mind when evaluating the influence system in the Closed Beta is that due to the content being limited to tiers 1-3 and lacking the endgame, the player behavior was artificially changed from normal play patterns. Watching players engage with the full content, they are more likely to try to make vertical progress by reaching tier 4, rather than spending many hours creating their own endgame on tier 3. To give you an idea about the influence balancing in the full game: The fifths residential tier, the Investors, will provide a huge boost to your influence pool which will allow players to customize their experience way more freely in the late game of Anno 1800. We absolutely agree with your feedback that the game needs to do a better job giving players the right information and context to make educated decisions on how to invest their influence points. Internally, we have already made some improvements here with better tooltips, though they sadly did not make it into the CB build in time. With all that said, we want to leave you all with a special treat to show our appreciation- the Anno 1800 Open Beta, coming April 12th-14th. So what does Open Beta mean? Just what it says on the cover- it will be open to anyone interested in testing the game prior to launch! No need to sign up, no need to cross your fingers to receive a key- just download the Open Beta client, and start playing once it goes live on the 12th. 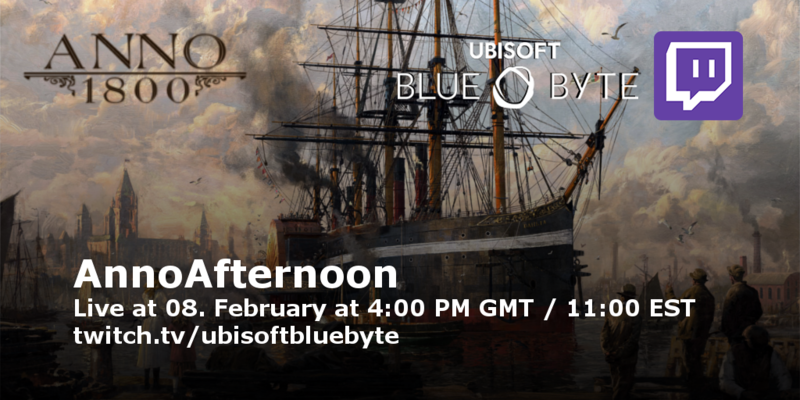 Save the date once more, as our Community Team takes to Twitch again to play Anno 1800 with you. We’re going through the Closed Beta Build and will be happy to follow suggestions from the community as to how we should build. And that’s it for this week’s Union Update. Thank you, and se… oh, you want one last final teaser? Okay then: the Open Beta will give you access to some new content that was not playable in either the Technical Test or Closed Beta. Next Post Screenshot Challenge: Our Winners! Thank you for allowing me to access this beta. I’m a fan of Anno games since the beginning. The year 1800 is really beautiful. I play with this configuration: I7.4GHz.16GB RAM.84 bit. Nvidia GTX980 graphics card. The game is fluid with the high setting. For improvements, would it be possible to create neighborhoods that are not just rectangular? And also to have a first-person view to walk around your city? The beta was great! It made me decide to actually pre order the deluxe version via the Ubisoft store! Yes this 42 old year guy still loves to play games! I play on 3440×1440 on a i7 6700K with a 1080Ti card. Everthing on ultra. It crashed twice on exactly the same moment: When I build the frigate and clicked on it. the game crashed to my desktop. I send the crash report. So hopefully that will be fixed. For the rest only noticed some little glitches but the game is definitely playable. Also the tutorial / hints/ tips was a bit lacking. Some quests I really did not now how to delivery a piece. I fished it out the water but did not know where to delivery it.. How to transfer it to the guy that needed. Was docked on his island but he did not accept it. For the rest I would say affengeil jah! Felicidades al equipo del credito. Un ANNO mejorado, y con una gráfica muy real, y de mucho gusto, todo. Edificios, gente trabajando o paseando por ell juego. Barcos, ataques entre barcos. Grande, muy grande. Gracias por permitirme acceder al Beta cerrada. Ha sido una buena experiencia. Ahora soy otro fan´s de Anno 1800, como he sido antés con 1503, 1701, y 1404.Gran Saga. I am glad to see that you keep an eye on the influence, it definitely needs changes or access to tier 5. Regarding the open beta: I am glad I will be able to play before the release (just send me my Pioneers Edition early and unlock the game on Uplay! 😀 ). But since it’s so close to release I think you should call it a demo, not beta because you won’t have time to change anything. And two days before release the game should be in finished stage, not beta stage! Btw. will I be able to continue the game from open beta after release in the full game? Can’t wait for the release! I still hope I can test the game again to help you improve it even more 😉 I would love to test it especially after the optimisation is finished. I have the same thoughts about the open beta name, but already someone called me a non-flattering name for posting a comment like yours :D.
Also forgot to mention another bug I came across. This one was frustrating. There is a problem with the bridges too. When I try to demolish them, I cannot. The bridges are stuck. I can’t remove them. So when I tried to demolish the old wood bridges, to upgrade to a stone bridge. I couldn’t do that. So I had to build the stone bridge next to the wood bridge. But that would be no help since carts will still use the slower wood bridge. Even if a paved street is connected to it. Greetings again! I managed to upload the siege I did on the pirates that I mentioned in my comment below. It is ready for viewing, and in 4k too! I’d like the Anno Team to see this, especially Basti, Marcel, and the others. This was a great battle! And I had a lot of fun too! Definitely a learning experience for me too! There where A LOT of bugs too by the way! There is a problem with one of the cannon towers. There seems to be 2 stacked on top of each other. So it looks like 1 tower, but there is actually 2 of them there. And you realize this when you see 2 health bars over the 1 cannon tower, or after you destroy the 1 tower, only to find there’s a second one in the exact same spot as the one you just destroyed still shooting at you. Oh and also one more big bug to report! When the pirate’s den re-spawns, their buildings are still ruined. Including Anne’s Kontor building, and all the defenses too. The cannon towers re-spawn, and so do all the other harbor defenses, they show a health bar again, but under them are still smoldering ruins (they still smoke too), and when my ships come back to attack again, the defenses do not shoot at me. And Anne’s Kontor building still stays ruined. I waited some more time, and still nothing happened. The pirates do not properly re-spawn. The quest ship did spawn, but I did not sink it. As I wanted to see if the pirates would re-spawn. And they didn’t. Only their ships re-spawn, but nothing else more does. So Anne Harlow is bugged. Not sure about the other pirate in the new world. I didn’t have enough time to get that far in the game unfortunately. But I strongly believe that is also something the ANNO Team should look into as well. I feel the other pirate’s den in the new world could be bugged too. Definitely something for the team to investigate for sure! I besiege Anne Harlow, and her gang of pirates. I sent a total of 31 Frigates at her. My first plan of attack was to weaken the island’s defenses first before going in for the full attack. I decided to cherry pick the first 2 cannon towers first. Sending 3 frigates at a time, careful to stay out of range from “Big Birtha” which I know does tremendous damage, and also does a area of effect (AOE) damage. This video starts after the siege has started. I already destroyed the first cannon tower. I already lost a few Frigates, but I with courage continue the attack! I ran into some trouble with the second cannon tower. It looks to be a bug. There seemed to be 2 of them stacked on top of each other in the same spot. Which made that part of the siege more difficult, not to mention the pirate ships that also attacked too. After cherry picking the first 2 cannon towers, and weakening the island. I send in the fleet to try take out “Big Birtha” first. I decide to send 6 at a time to prevent a ship traffic jam, because the entrance to the harbor is very narrow, so only so many ships can pass through. The first wave fails, but managed to critically damage the “Big Birtha” Then I moved in with another wave of 6 frigates to finish off “Big Birtha”. After that the pirate’s defenses started to give way. And I managed to obliterate the den. I lost almost half of my Frigates during the siege. But I was able to put Anne out of commission, to stop harassing my trade routes. I know the devs said to be nice to the pirates, but I wanted to let them have it, while the Beta was still running. I don’t really negotiate with pirates, and I wanted to avenge Bellenar’s attempt. That he tried in a previous ANNO Cast he was in, when he tried to take out the pirates, but failed to. So Bellenar can now get some satisfaction, knowing that Feruda managed to get sweet revenge for him! And I definitely was sure to send Bellenar’s best regards to Anne! I really enjoyed this siege. It was a lot of fun, and also a learning experience for me too. 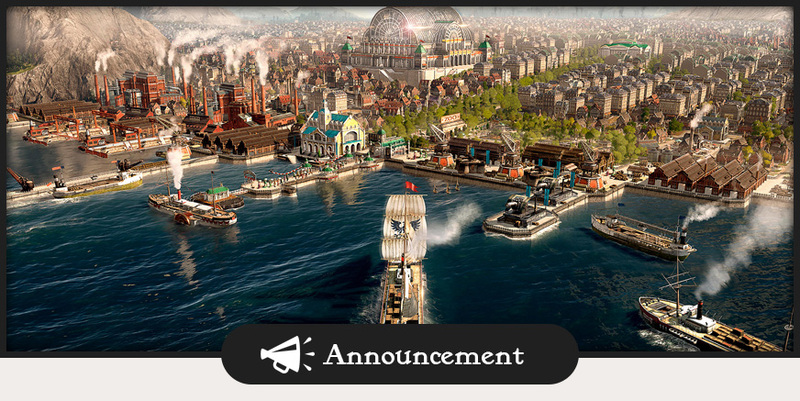 I am very impressed with the dev’s progress on ANNO 1800. I really look forwards to the game when it launches! I love how much detail there is on every corner and the huge amount of people in the streets on the game! It was a great chance to try the closed beta, I enjoyed it. The last time time I played Anno was very long ago, it has improved a lot since then. Upgrades in everything, graphics, speed, smoothness, ideas and the map itself. Very nice work and I had no specific issues in spite of trying it at the minimum requirements. Thank you very much for such an oppurtunity and I wish for you to keep up with the good work. I Really liked the beta, and the small improvements over Anno 1404. I’m definetely going to get the game. Greetings! Thanks for doing a closed beta! It was absolutely great! I know in the last blog I mentioned I didn’t get a beta code. But when I looked at the blog again, and saw that your friends CORSAIR was giving out codes. I was able to get a beta copy of the game. And I am glad I did! This beta caught me at a very perfect time too! I was in the middle of debating whether or not to upgrade my graphics card from a GTX970 to a GTX 1070ti. And I decided to do some experiments to see how the game runs with the 970 then the 1070ti. I know the recommended graphics card for the beta was a 970. But I have a 4k monitor, and I know the 970 does struggle to power it. But switching to a 1080p (HD) resolution helps a lot. So I tried to run ANNO 1800 on mostly high graphics in HD and I got horrible fps. Mostly 20 to 40. Sometimes higher like 50-80 fps. There was a lot of lag too. So after that I decided to upgrade to my GTX1070ti and see what happens. And the performance was much better. I have also 32 GB of DDR4 RAM CORSAIR VENGEANCE LPX 2666mhz, and my processor is a INTEL CPU a i7-6700 running at 3.4Gz and it has 4 cores. I have a Windows 10 64 bit PC. More details on my findings below about graphics performance, that I tested with the beta. I hope my findings, and this feedback proves very useful to the ANNO Team. I have a ACER X34 PREDATOR 4K gaming monitor. And before I ran the game, and this monitor with a GTX 970. And even on the mid HD settings it struggled, A LOT. Even on 4k settings it struggled too. Luckily of for me I have a GTX 1070ti in stock. So I upgraded my graphics card (devs recommended a GTX 970 which is why I didn’t upgrade my GPU yet. To see how it would run.). Then when I ran ANNO 1800. It did much better. I ran on 60-100 FPS on mid to high graphics. On an empty island. But as your city grows, the performance dramatically drops. So near the end of the Beta when my town was huge. I ran around 20-70 FPS. In the city I would run around 30 FPS on mid to high range graphics in 4k. Certain view angles help a little. I get around 30-45 FPS. But at sea I get a good 50-85 FPS. Of course the devs mentioned that this is still WIP(and these are not the final graphics specs), and as they polish off the game, they expect better performance. I sure hope so, as I want to play in 4k, and I would like good FPS on mid to high range graphics. What is good for me? 60-100 FPS no lower. That is what I would like to see in ANNO 1800. I expect big performance improvements at launch. Playing ANNO 1800 in HD resolution on a 4k monitor is not very visually attractive. Especially on a wide screen like mine. So I am hoping for big performance improvements as the devs promise it. Don’t let me down ANNO Team! Oh yes. I also have to mention that I ran into some bugs. When you build some of the ornaments (like farmers trees, and Artisan hedges) they are glitched. The tree doesn’t spawn and it is a empty dark green tile. The trees effected are mostly the tall big tress, but the little ones also act up from time to time too, including the bushes. This happens when you build AND upgrade from blueprint to real building too. And for the artisan hedges the white stone border doesn’t show either on all of them. When I built a ZOO and did a hedge to go around it. To make it beautiful. That is where I ran into this problem. But most of the ornaments work well, and I was very impressed too. There was also some glitches with the ships, but that’s already known. I launched a flotilla of 31 Frigates at the pirates, and I had plenty of trouble controlling them all. I tried to micro mange my fleet to get the most out of it, and do a tactic to destroy the hideout, but I did run into issues. Also the pirate den (Anne Harlow) is too close to the edge of the map. So when I sail to plot a siege I hit the boarder of the map and am forced into the hideout, then the “big birtha” gets me and blows up my ships. Not cool. I didn’t have enough time to reach the new world unfortunately (only had 2-3 days to play). So I built a huge town of mostly farmers, workers, and a good amount of Artisans. I really enjoyed playing around with the production chains, paying attention to get the correct ratio of the buildings needed for a efficient chain. I managed to get the Union Island on the map I played on, so I built a lovely city on the Union Island. The views where breathtaking, and the music just beautiful. I absolutely love ANNO 1800, and can’t wait till the game launches! And yes I did throw a flotilla of 31 Frigates at the pirates. I fared better than the attempt Bellenar made during the ANNO Casts lol. I sure let Anne have it! Later in the game I managed to build some Ships Of The Line and also threw them at the pirates too. And what fun that was too! I also managed to get some items from the destroyed pirate ships flotsam. I managed to get mortars, and torpedoes! I used the torpedoes the sneak up on the mouth of the pirates harbor where a pirate ship was anchored inside the harbor, and I shot the torpedo at it, and blew it up in 1 hit! Talk about a pirate assassination! I never had so much fun in a ANNO game. This was the best 3 days I ever had in a long time in any ANNO game. You go ANNO Team! Thumbs up from me! I love ANNO 1800. I really look forwards to playing the finished game! I will be posting my entire video series to my youtube channel. So if Basti, Marcel, and the other devs, and the team would like to see, go ahead! I already uploaded some of them. They also show the bugs I mentioned above too. But those come in the later videos. I think I have well over 30 videos, and I uploaded 5 so far. Thanks again for doing a closed beta. I really enjoyed playing it! I will also try get the flotilla I sent at the pirates uploaded soon too so you can all see my attempt to thwart the pirates. I have part 2,3,4,and 5 also already uploaded. The rest will come in the coming days, weeks, whenever I can. I will try get the flotilla I sent at Anne up as well too soon. Maybe in time for the next Anno Cast on February 8th. Not sure if the devs will share footage and screenshots players made during the beta in the cast. But just in case I will try get the video up soon! Thanks again for doing a closed beta! I really enjoyed playing, and trying out the game! Thank you! I am very impressed with how the game is coming together! Fantastic comment and great effort. Game really worked wel and smooth with no glitches on my computer. Sorry to say only got in about 12hrs of log in time due to family illness that came up. Looking forward to the release and have already pre ordered the game. Thanks for the opportunity to play the beta version of Anno 1800! This is very motivating to pre-order the game. You did a great job and made a good game! Is it possible to add a “mayor’s office” to the game, where players could see the summary statistics on the development of settlements? Exceptional job guys! Am ready to book time off work when this is released. Keep those wiki details coming so I can read up on it all. Great job you guys did, i loved playing the Beta, the new building mechanics without area of effect for buildings like church and the farm fields are awesome. Is there a questionnaire that i can fill out to help? Just call it a demo and we are fine with it:P.
Guys you really make me worry, why call it an open beta a few days before the programed launch? Open beta implies the game needs more testing, and with only two days before the programmed release it isn’t a good sign. Thanks for the update. Hopefully UI will be another topic you guys will take the feedback into account. To me there were the most pressing issues. Hello Anno team, if you don’t mind me asking, on your The Age of Steam – February 8th 4 PM GMT, could you show us a bit about buying shares, while I was playing the closed beta game I could not figure out how to buy shares, watching AI’s buying shares on my island in the game seems so unfair? Hey, if you still don’t know it, I can tell you. If you have your camera above an enemies island, you can click on the little arrow on the top of your screen, right below the fertility information. A new window should pop up with information about the shares (in kind of a pizza form). You can hover over it to see how much a share costs and you can click on one “slice” to buy a share. I got no problems to report or even questions about game play but I thought I’d like to say that after playing this Beta test, I’ve not wanted a game to actually be available right now for quite some time. Good job in my view. Will there be more content that is playable in the open beta then in the closed beta (higher residential tiers)? As they state in the last sentence, there will be more content. I can only assume that a few days before the launch this will include all residential tiers.